Are Stores Always Responsible For a Slip and Fall Injury? You should never suffer injury while shopping for groceries. Unfortunately, hazards lie around every corner at your local supermarket. Slip and fall injuries are particularly common. In fact, according to the National Floor Safety Institute, there are over 1 million visits hospital emergency room visits each year resulting from slips and falls. If you, or a loved one, fell on a slippery floor or tripped on torn carpet, the store may be liable – but this is not automatic. Several forms of negligence can cause grocery store customers to slip and fall. Most common? Wet or slippery surfaces. Spilled foods and liquids cause hazards, as do moisture from wet shoes or boots. Improperly maintained surfaces could also lead to accidents. For example, stores can be held liable for failing to fix torn carpet or uneven flooring. We have represented clients in grocery store slip and falls involving grapes, tomatoes, dish washing liquid, meat cuttings, leaky coolers, and wet floors. The fresh produce areas of grocery stores is notorious for having slippery floors due to fruits and vegetables being spilled on the floor. the failure to use reasonable care proximately caused injuries to the plaintiff. If unable to prove actual knowledge of the hazard, the McKinney slip and fall plaintiff should at least demonstrate that the dangerous condition existed for such an ureasonably long period of time that the responsible party should have known of the problem. This constructive notice can be difficult to prove. Spills occur regularly in busy stores. It’s tricky to determine whether a particular spill occurred a few minutes or a few hours ago. Unfortunately for victims, there’s no such thing as automatic liability in a slip and fall case. Lots of good evidence is needed to prove the store’s negligence. For this reason, it’s never wise to go it alone; strong legal representation is absolutely essential. Let a slip and fall attorney at Underwood Law Office help after your accident. We have handled many decades of personal injury cases. Our lawyers can help you recover the maximum compensation available in your accident case. 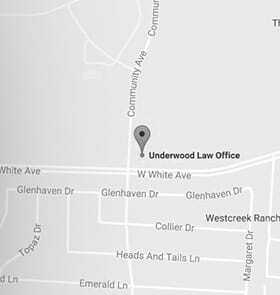 The Underwood Law Office provides proactive representation for victims of McKinney slip and fall accidents in McKinney, Texas. Call 972-535-6377 to learn more about our personal injury services.